Unbelievably sad. Are other non-christians going to face the same consequences? I am not sure I understand your line “un-Masonic Mason”? Our oaths clearly state “A SUPREME BEING”. While I have no ill will toward any man for his religious beliefs, I believe that Freemasonry is quite clear as to what it requires of its membership. The prequel to the first degree obligation really sets the stage and while I will admit that I am not as learned as many other brothers with regards to religion, I always took and accepted that our principles was based in the belief of ONE supreme being. Wicca clearly does not adhere to this. So what is un-Masonic about a Grand Master asking Brothers to adhere to their oaths or resign? If there is more to the story as you allude then share it before you make derogatory comments and allow all of us the opportunity to examine the facts. Even though you may feel the Grand Master has acted poorly does not give you the right to shirk your own obligations. Give the man his due. Being a Grand Master is not an easy task. Let the protesting commence Brethren. I am certain that I will not be alone in asserting that the various Liberal Masonic obediences operating within the United States would be happy to accept any such masons that the Grand Lodge of Florida thinks unfit. Given that they have to demonstrate the courage of their convictions far more than those practicing more “mainstream” religions, it would seem to me that they would make better not worse masons. Besides, most of us in Liberal Freemasonry are more in touch with the metaphysical and Hermetic aspects of the craft than any mainstream Grand Lodge would be. I’d encourage any finding themselves thrust out of the GL of Florida, to feel free to contact me. They might find a happy alternative to mainstream masonry. And as I note, lest you be concerned about Liberal masons, don’t believe what they say down at the Grand Lodge, whenever we feel irregular we use MiraLax, and we’re not at all clandestine about using it. Wicca is actually another blanket name under the larger blanket name of Paganism (think a subcategory of a main category) and includes theologies based on a single diety and/or multiple dieties. Likewise with Hinduism but I see no problem with them. Trinitarian Christianity does not, either, when viewed from outside of its own adherents. And, if you’d care to read some of the sources on Wicca, like Gerald Gardner, he pointed out, in _The Meaning of Witchcraft_ (pg 27 of the IHO press version, I believe) that witches believe that beyond their God and Goddess, there is a Prime Mover. Surely, if Hinduism counts, then such a belief would. One Supreme Being? My Hindu Brethren whom I initiated and passed in my Lodge in the past two years would be very confused about that. I think that all the above, other than perhaps Agnosticism, would pass the “Supreme Being” test. The GM will say, in clarification, that of course he doesn’t mean that Masonry in Florida is only for Christians, he’ll allow that Jews and Muslims are okay (and, if he’s generous, Hindus) … and he’ll portray that statement as being a magnanimous one, at that. There are a majority of Masons, I would suggest, who honestly think that if it isn’t one of the big three, it ain’t fittin’. And you know all those Wiccans are devil worshippers, or tree-worshipers and non-believers in a supreme being, no matter what they say to try and skate by. Never mind that Gerald Gardner, in _The Meaning of Witchcraft_ pointed out that witches, while having a God and a Goddess, believe there is a prime mover, a higher being, beyond them – we ll know he was lying, right? My worry is that this will spill over into other GLs because of the hoopla, and those GLs will issue similar ruling without doing any investigation, and more Brothers who weren’t affected by this will be. Thank the All that at least one New England state GL ruled on a similar situation in the mid 90’s – some may be safe, there. A man is required to profess a belief in a Supreme Being in order to be a Mason. All those religions mentioned do indeed uphold a belief in a Supreme Being. Evidently, it is not the same Supreme Being the Grand Master of Florida believes in. However, that is not his business. We are not a religion. We don’t get to dictate to the Brethren what their beliefs must be. Not ever. Why do you think we’re not allowed to discuss religion in lodge? Besides, throughout the United States we have Brothers who are Hindu and Muslim. India is LOADED with Freemasons who *gasp* are Hindus! The Grand Master of Florida stepped out of line on this. Religious Orthodoxy is not part of Freemasonry’s requirements for membership. Brother Morin I have been meaning to address your comment but have been on overload for a few days. You say, “I always took and accepted.” In other words … in my opinion. But it is not what you think or perceive or what your opinion is, it is what is fact that counts. Some jurisdictions only require a belief in Deity. Others require a belief in a Supreme Being. Still others require an adherence to Monotheism. I have not heard the phrase ONE SUPREME BEING used before but I am open to learning. You need to go to your Grand Constitution and find out exactly what your Grand Lodge requires. Don’t think, know. If you will take a look at the next story you will find that the Brother for whom this religous edict was written was a Deist. Where is it in the traditions of Freemasonry that a Deist does not qualify for membership? Go back to the American Revolution and you will find many Deists who were Masons. And why is it our duty to interrogate a Brother on the particulars of his faith once he has declared a belief in Deity? 3.Adherence to the Ancient Landmarks � specifically, a Belief in God, the Volume of Sacred Law as an indispensable part of the Furniture of the Lodge, and the prohibition of the discussion of politics and religion. It does not specified, said God. Unfortunately the GM decisions are usually taken as law and their may be those that feel the need to silence their beliefs in order to remain Masons in FL! Good for you, Brother, and a man’s faith is his own affair. It is not for us to interrogate ANYONE. A rose by any other name would still be religious persecution. When I prepare candidates, I always ask if there are any atheists and explain why I ask that. That will be the beginning and end of the subject. I will never participate in a witch hunt. I know pagans and they do believe in a higher power. Well done, Brother. The behavior of this GM is appalling and repugnant…but to me, not a surprise. This same level of institutionalized intolerance drove a brilliant Mason away from the Craft in the early 1990’s. A Brother I brought to Masonry via the military lodges in Europe returned to the US and found work in FL. During his first visit to a US lodge, he was approached by members and asked if his military lodge was “one of those Lodges that allowed n*****s in”….he left and never returned. I, too, found the racial intolerance to be repulsive – American Freemasonry infected with small-minded bigots – and did not attend Lodge for years. I returned to the Craft in Colorado and am proud to say my Lodge’s altar is crowded with Volumes of Sacred Law. I count among Lodge members Catholics, Protestants of numerous denominations, Jews, Muslims, Pagans (Wicca, Odinist, Druids), Taoists, Hindi, Buddhists, Gnostic Christians, and Druze. Let’s support our Brothers who are being persecuted and pray common sense and the True Light of the Craft prevails. Gnosis is Greek for Knowledge and might just be the secret meaning of the letter G. The Germanic guttal word we use for the deity may be of later times. In the early years of Christianity there was great debate over whether Jesus was of God or a God. the a God side won at the council of Niciea and elected Jesus not just a God, by through a veichle invented at the Council of Nicea called the Trinity, elected Jesus God or The God. Even many devout Christians secretly accept that Jesus and God are two different things, in fact Masonry demands it, given that we claim to accept those of other faiths who believe in a diety. Those on the losing side of the close vote at the council of Nicea, who think Jesus is merely of God not a God, were called the Gnosistics. Many Masons may well be Gnostics and not Gknow it. Just to put a historical perspective on things, Sir Winston Churchill was a Druid. Would this disqualify him from being a Mason in Florida? Which makes me wonder how many more of the 10,000 Famous Masons would not be eligible to be Masons in Florida because of their Pagan or non-Abrahamic religious affiliations. Of course I agree with the general condemnation of this decision, but for the sake of accuracy, I would like to point out to brother John Lawrence that Winston Churchill was a member of the AOD which was a masonic-like fraternal order whose members were overwhelmingly Christians. In fact, most members were masons and in 1886, well before Churchill would have joined, the majority of the non-masons within the order were expelled. This “druidism” should not be mistaken with any form of pre-christian “celtic” religion original or revived. It’s okay to say it: the Grand Master of Florida is out of line. It is most interesting the timing at which this happens; right after Thanksgiving and at a time when our lodges are undergoing their month of elections. Most of us will not speak out now, because at the end it is the main duty of the WM of a lodge to maintain harmony within his lodge and this, at such delicate times, will surly cause disharmony. However, let me give you an insight into a Floridian Mason’s mind, which is the mind of many that are as well repulsed by such attack to our Masonic Landmarks. I myself belong to the judo-christian tradition. One of the things that brought me to the lodge was a further spiritual need and points of view different from those my own tradition has taught me. It is after all part of the life of a traveling man to learn from his travels. I have to say that the craft provided me what I was looking for. It was the strong bond, that cement which unites us into one edifice which is so strong and such a fertile ground that I understood it’s secret: that strong circle of fellowship. In my travels down the Masonic years, I have met Jews, Muslims, Wiccans, Gnostics, Druids, Hinduists and many other faiths. From such brothers, I have met different faces and moods of the GAOTU and through them I have been able to put together the puzzle of the “self”. The teachings of my older brethren of tolerance and compassion have taught me to become one with mankind, specially my brothers Masons, and helped me understand that Freemasonry is not a religion but it is religion. It is in such a way that it doesn’t only give you the blue light shining through a piece of stained glass but it gives you the whole stained glass window. What would be the the Sephardic Tree with only one emanation after all? What makes a mason is a religious man; not a fanatic man. What makes a mason is not one religion but many or all at the time: a man with his heart open to other truths which will eventually release his hoodwink to see the whole stained window, instead of only a color. This kind of sad events my brothers, are usually remembered forever but don’t last forever. Such is the law of karma, or of correspondence of the Hermetic tradition, or the simple will of TGAOTU to at some point will straighten a branch that grew away from sunlight. Stay put brothers… this will eventually be resolved. I am the Odinist that was forced to resign or face expulsion. My brother Corey and I resigned together in a dignified manner despite our lodge making us castaways and unworthy. Tonight my class was raised without me. I feel lost and overwhelmingly numb. I am a fellowcraft Mason “at large” without a blue lodge. For the record I am a tribalist and NOT a supremest as some slanderous person(s) have attempted to spin doctor the facts. I believe in the All-Father, I believe my soul is enduring beyond transmigration and that it will dwell in one of the Great celestial Halls. My crime as stated in the letter I was given was that when the MW Aladro spoke with me on the phone (grilling me about the specific details of my belief system) that I stated I was an Odinist. Ironically, over the phone, the GM told me that although he disagreed with my religious inclinations that I had met the requirements. So what happened between the phone call and my receiving a letter “arresting” my progress to Master Mason? Aladro also commented to me that I should consider a different fraternity better suited to my kind of people. Ufdah… I don’t believe I can suffer any more FL Masonic religious rigidness. You and your brother are welcome in the more civilied precincts of Liberal Freemasonry. I also noted that another brother recommended you contact the Prince Hall Lodges for membership. The point is that there are civil and intelligent masons who are willing to support you and give you a home. Feel free to contact me at any time, if you want to talk about what alternatives exist or just to talk. My email is eoghan.ballard@gmail.com or you can contact me through the Hedge Mason blog. We consider you a mason in good standing. Now, I know my opinion will be shared by probably none in the Florida Lodges, but if Mainstream Floridian masons had any sense of justice, they would demit en masse and shut the sucker down. That would show they really are masons, because if you stand by and let this just happen, in my book you are neither man nor mason. It might just be the wake up call mainstream masonry is looking for. Otherwise, proceed into the past. That would show they really are masons, because if you stand by and let this just happen, in my book you are neither man nor mason. The problem with leaving the order over the matter of religion, just like a few years ago when some Masons suggested leaving the order because of alleged racism, is that you leave nobody who can change the organization from within. Most organizational change (and not just in Freemasonry) happens because progressive-minded members work inside the organization itself to shed light and bring change through precept and example. Yes, leaving sends a message, but in the long run, it’s more important for right-thinking people to work toward having the organization as a whole move in a better direction. That makes sense, in theory. In practice, there is no change happening. People are leaving in dribs and drabs and the mainstream institution is dying a slow death. A large, unified action would make a real statement and force change. As it is, a lot of people try making sense, as you have, and no change ever takes place. Sorry, Tom, you make sense, just not progress. It comes down to whether masons will do something other than sticking their heads deeper in the sand. So far, I hear a lot of what sounds from here like burrowing. Blessing to you, my brother. The problem with leaving the order over the matter of religion, just like a few years ago when some Masons suggested leaving the order because of alleged racism, is that you leave nobody who can change the organization from within. 2) You can change Freemasonry from without. You can opt out to another Order – Prince Hall, Co-Masonry – your choice. Then you can write, blog, post on Facebook and Masonic Forums changes and actions that Brothers could take if they so desired to reform the system. The problem with today’s Mainstream Freemasonry is that the Grand Lodge system as it governs Freemasonry now is an overpowering bully and it takes no prisoners. Grand Masters in jurisdiction after jurisdiction can enter a Lodge and expel you on the spot without a Masonic trial and pull the charter of a Lodge and close it down – just like that! And it is being done over and over again across this nation. Duke, come look me up on FaceBook. I run a Masonic group there where you have MANY supporters! I am sorry this happened to you. It is a black mark against Florida’s GM and a stain on Freemasonry in the state of Florida if they do nothing about it. Wicca adheres to – or deviates from – monotheism every bit as much as Trinitarian Christianity, and for exactly the same reasons. Yes, brother Morgan [shudder], we know where this will go. I just wish some of these religious bigots would be consistent. A belief in a Creator is ok, but a G-d and G-ddess is not, but a Father and Son AND Holy Spirit is ok again. So, if your belief looks like it has one or three deities, that fits, but if it looks like your belief sees two aspects of deity it is anathema? Oh, wait! I have it. Odd numbers of deity are good, even numbers are bad. Is that it? How about that other Masonic Landmark….the one where we’re not supposed to discuss religion in the Lodge? 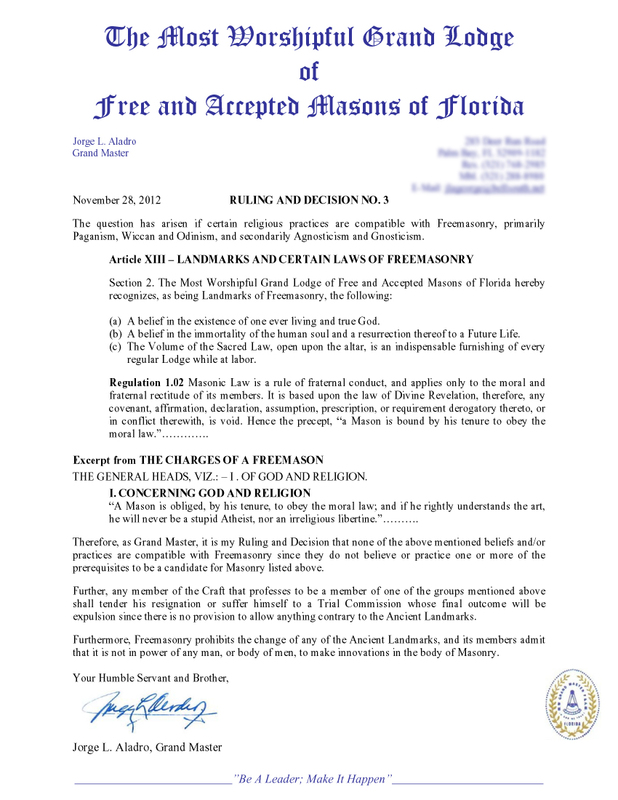 Just out of curiosity, when did the Grand Lodge of Florida merge with the Vatican? Another dark day for Freemasonry. My only hope is that the rational brethren in Florida will take a stand and have this shameful decision overturned. Otherwise Florida could become the next Grand Jurisdiction to find itself deemed irregular by regular Grand Jurisdictions around the world! Good to know you haven’t lost your sense of humor, brother! Well said. Some religions ARE more equal than others, yes. While I’ve no personal involvement in this, neither aspiring to become a Mason nor knowing anyone who is, it does concern me as long having been communicant in the Wiccan religion. You know, it’s the easiest thing in the world–and correspondingly as meaningful–to utter some stock catch-phrase like “Supreme Being” or “One God”…and it’s quite another to *live a religious life*, turning toward and being responsive to the Powers that move through our world. With respect, I’d offer for your consideration that it is far more valuable to honor that commitment, that sensitivity, than it is the repetition of catechism or text of any kind. How vain we must be to think the sacred is our private possession, to be taken down from the shelf and displayed–then put back until the next time for use arrives. Blessed Be. I will say that I am pissed off at some online (predominantly white) Masons who have formed, or are commenting on, the the “Masonic Landmarks Restoration” fb page – they say that FL should be considered irregular over this. And I can’t help but wonder what our PHA Brethren will say when they see some white Masons willing to take a stand over Wicca, when they HAVEN’T done so over the 8 or so GLs that still don’t recognize PHA. Frankly, I expect there could be some righteous indignation and bemusement at people only giving a damn when it hits them personally, but someone else’s plight? No big deal. What am _I_ doing about it? I’m doing no more and no less than I am doing on the Wiccan issue with Florida – I know my GLs have decided that they will not confront the southern GLs over their non-recognition of PHA, because they don’t want to get involved in someone else’s sovereignty – so they won’t do so over an even SMALLER group of men. In short, yes, religious bigotry in Lodge is bad, but we (mainstream GLs) have been sticking our heads in the sand over racism for FAR longer than we have ignored bigotry against Wiccans, and that, frankly, disgusts me more. No. Religions embraced by the GM are good. Everything else is bad. It’s called discrimination, and Brothers in FL need to lawyer-up to put a stop to this. It’s Masonry, not the Klan. There are a number of catchlines in that book, specifically “Four legs good, two legs bad” (which Br. Gene kind of referenced on the odd/even comment) and “Somer animals are more equal than others”. All of which points back to the situation as being one of idealism leading to leadership by diktak. Oh I’ve read Orwell many times. I preferred Burmese Days, though Animal Farm and 1984 gave us a LOT to quote. Point remains though….this sort of thing will continue to happen while Brothers let it happen.